Do you have a game where players can visually see what enemies are using? For example, depending on what armor they wear, their appearance will change. Or perhaps you have a stealing mechanic that allows you to steal enemy weapons and armors, which would lower the enemy’s strength and defense after those equips have been pilfered! 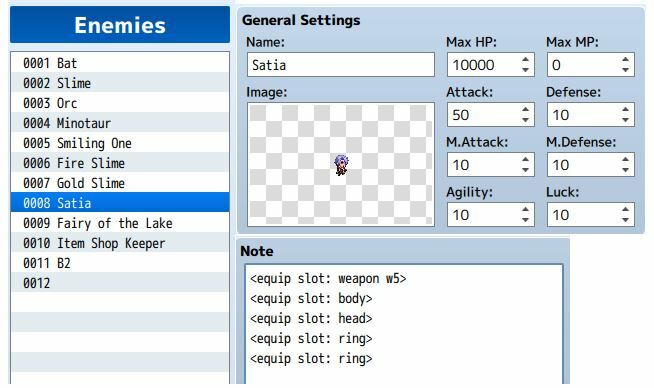 This plugin provides you with the ability to give enemies equips. Enemies will receive all of the parameter bonuses and traits that the equip provides. If a skill requires a certain weapon type to be equipped, enemies must have the weapon in order to use the skill. Start by installing the required plugins first. Then, download ths plugin and place it in the “plugins” folder in your project’s “js” folder. Then open your Plugin Manager (F10), double-click an empty row, and select the HIME_EnemyEquips plugin. For details information on how to set up equip slots, please see the usage section for Equip Slots Core. Just a reminder, but like actors, enemies will need to have the appropriate “equip” features so that they can actually equip weapons and armors. You can use script calls to change enemy equips during the game. I will provide an example. We start by getting the enemy that we want to change equips. Where the INDEX is the index of the enemy you want to choose. 0 is the first enemy, 1 is the second enemy, and so on. Where the SLOT_ID is which slot you want to set the equip to. 0 is the first slot, 1 is the second slot, and so on. If successful, your equip will now be using weapon 3. This plugin provides functionality for equipping enemies. However, this does not mean your battle system will automatically display weapon animations. You will need to have the battle system you’re using updated to support enemy equips. Just starting the test battle I get this crash error: Cannot read property ‘wtypeId’ of null. I use Yanfly’s: Battle engine core, animated sideview enemies, weapon animation (just to see the enemies attack with weapons), action sequence and Ramza’s: dual wield.. I gave the enemy his corresponding weapon type in Atributes section and in the Notes section, I don’t know what else should I do, or maybe this plugin isn’t compatible with the ones I mentioned. It wont let me correct myself. with this script, making a break or steal enemy weapon its 100% possible omg thank you! Becomes target.changeEquip(x,y); making it where the skill can target anybody, or just the enemy if it’s an actor only skill. what if i want to change enemy’s armor during combat? what if i want to change enemy’s armor? make the skill have a note tag doing it or either call a common event that removes an enemy’s weapon? or have on the enemy page a condition if destroy weapon skill used, remove weapon or so it should work.. Please disable all other plugins except Core Equip Slots and Enemy Equips and determine whether the gun animation works. My gun animation for actors works when Enemy Equips is installed. Or at least, I think it does. The actor just pulls out a gun and there’s a little yellow thing at the tip and that’s it. I don’t know why but for some reason my gun attacks aren’t working now. Everything else is fine. Guns attacks for actors or enemies?